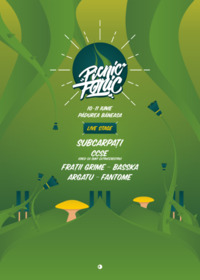 Ladies & Gentlemen, At its second edition in 2017, PICNIC FONIC comes back with a stronger, better and louder summer experience for MUSIC ADDICTS & HIGH-VIBE TRAVELERS. It is a mix of contemporary urban delights. Counting on an extra sensorial experience we introduce a bigger FOOD zone dedicated to Romanian street food brands. Picnic's food & beverage partners will exhibit culinary experiences across the whole weekend during the event. Taking advantage of the location, a superb forest near Bucharest, the sun and the energy of the forest will bring people together andt here will be special area dedicated to some recreational activitiesfrom sports fields & leisure.